JAZAMS THROWS A PARTY: People of all shapes and sizes showed up for the Jazams Summer Block Party Friday, from Munchkins and Mona Lisas to human Towers of Pisa. Music was provided by Alex Mitnick and the Kaleidoscope Band. Borough Council adopted the 2009 municipal budget at last Tuesdays meeting. At $24,647,374, the budget involves no tax increase from the previous year and represents a 2.7 percent decrease over that of 2008. The tax rate remains at $1.03 per $100 of assessed property value. Swine flu is making its presence felt in Princeton. As the week unfolds, we continue to see confirmed cases of H1N1 flu across the district and throughout the community and Mercer County, according to Princeton Regional School Superintendent Judith Wilson in a recent letter sent to parents and community members. Additionally, many students are experiencing flu-like symptoms including fever. Four confirmed cases of the flu have been reported at Princeton University. During a community presentation hosted by the Senior Resource Center last Friday, Princeton HealthCare System President and CEO Barry Rabner spoke about the amenities of the new health campus being built in Plainsboro. Eric Daniel Metzgars documentary, Life. Support. Music., which tells the story of guitarist Jason Crigler and his dramatic recovery after a massive brain hemorrhage, was screened at the Princeton Public Library last Wednesday. The filmmaker was on hand to discuss his work. For those who may have been delighted by the antiquated typefaces and illustrations that graced last year’s crop of how-to children’s books initially inspired by the success of The Dangerous Book for Boys, the Cotsen Children’s Library is offering the real thing in its current exhibit, “Kites, Fireworks, Physics, and Fancy,” and there’s no comparison. How could anything compete with seeing John Bate’s 1635 publication, Mysteries of Nature and Art, the book that taught the young Isaac Newton how to make a kite that could be set on fire for flying at night? Sean McCourt was cautiously optimistic about the prospects of his Mercer Junior Rowing Club (MJRC) womens open four as it headed into the USRowing Youth National Championships last week. It’s a requirement of popular culture that you strike an ironic distance. This doesn’t. It’s a film about women and their whole experience being hopeful and youthful and older and suffering the regrets that you have over a long life. It’s visceral and I love that. 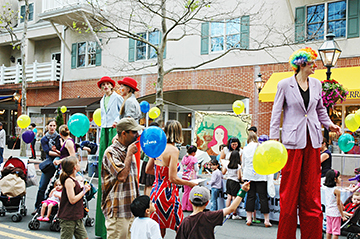 The Princeton Festival is opening its season from small to large this year. Saturday night featured the eight-voice show The Fantasticks, leading up to the centerpiece opera production this coming weekend of Benjamin Britten’s A Midsummer Night’s Dream at McCarter Theatre. The Festival staged The Fantasticks in the small and intimate theater at 185 Nassau Street, and although the logistics of the theater were a bit problematic for some of the older audience members, the closeness of the space enabled the audience to feel directly involved in the play and made mikeless singing very easy for the performers. Nancy W. Kieling has found her calling. She forges connections, builds endowments, and promotes philanthropy. Through her work as President and Executive Director of the Princeton Area Community Foundation (PACF), she is uniquely able to help a wide spectrum of people in various walks of life throughout the area.